In Conjunction With The Department Of Veterans Affairs, My Vet Connect, Holy Cross Assembly #1622 Fourth Degree Knights Of Columbus, And Holy Cross Cemetery And With Gratitude For Research Provided By The Polish Genealogical Society Of Michigan ~ Valerie Koselka, President ~ And Mr. Tony Tardif The West Side Detroit Polish American Historical Society Announces A Commemoration And Grave Marker Ceremony In Honor Of Armed Forces Day And Civil War Hero Francis Busha. Saturday, May 21, 2016 ~ Holy Cross Cemetery 8850 Dix At Lonyo, Detroit 48209 ~ 1:00 P.M. 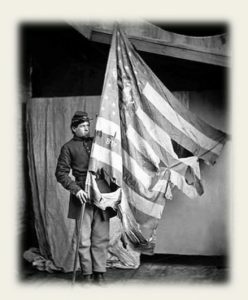 Opening Remarks: Department Of Veterans Affairs; Placing Of Memorial Wreath, Lighting Of Memorial Candle And Military Gun Salute: 17th Michigan Volunteer Infantry Regiment Company E, Inc. (“The Stonewall Regiment”); Playing Of Taps By Trumpeter Ernie Skuta. With funds generously provided by the four organizations referenced above, WSDPAHS has procured a suitable grave marker for this Civil War Veteran. Through the generous research efforts of the Polish Genealogical Society of Michigan, we obtained Veteran Busha’s preliminary history. Further research and marriage records revealed that Francis Busha is of French Canadian heritage. Veteran Busha was born in Springwells Township in 1836. He was married to Marie Livernois at St. Alphonsus Catholic Church on January 7, 1868. Marie’s father was Daniel Livernois and her mother was Emeline Riopelle. Francis enlisted as a Private/Teamster in Company B of Michigan’s 4th Volunteer Cavalry Regiment on August 28, 1862, and mustered out on July 1, 1865, at Nashville, Tennessee. He was part of the regiment that pursued and captured Confederate President Jefferson Davis and his family, as well as high ranking command officers and department heads, on the night of May 10, 1865. He died on June 3, 1879, at age 42. Additional biographical information will be provided at the event.